This is a gluten-free recipe that is super-quick and easy to make. Kumara, also known as sweet potato, is a nice addition to this recipe and matches well with avocado. When avocados are in season, and cheaper to buy, make the most of them and stack plenty on! As you can see from the recipe there are many ingredient alternatives (listed below in the brackets) and you can mix-and-match with what ingredients you already have. Cook onion until clear (if using spring onion as an alternative, there is no need to cook). Place grated kumara, corn, eggs, feta, onion, coriander, flour, and pepper and salt in a bowl and mix well. Add oil to a fry pan and cook fritters until golden brown. Keep warm on paper towels in the oven. 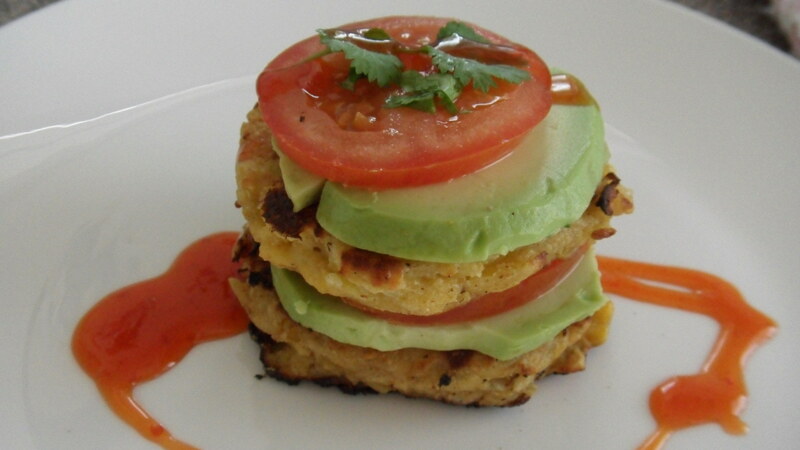 Plate up by stacking layers of fritter, avocado, and tomato, then garnish with coriander leaves and sweet chilli sauce.